Today is the 140th anniversary of Carl Sandburg’s birth. Sandburg began his long and broad career as an American Imagist poet, political activist, and journalist, and he went on to add prize-winning biographer, folk-song revivalist, and goat farmer to his resume. If one was to make a list, he would be in a small group of American cultural forces in the first half of the 20th Century who created what we today call “Americana,” and helped make sure that this label could be applied, as it can be today, to a musical genre. I won’t have time to go into this today, but in 1927 he published “The American Songbag,” which is as important a landmark in the American folk song revival as “The Wasteland” is for high-art Modernist English verse. “They tell me you are wicked and I believe them, for I have seen your painted women under the gas lamps luring the farm boys. Though “Chicago’s” Whitmanesque/expansive-litany style is one that Sandburg would continue to use at times, its prominence has overshadowed Sandburg’s sparer Imagist voice, the one that he used for the rest of the poems in his landmark “Chicago Poems” collection. It’s easy to think that if Sandburg had spent time in Europe hobnobbing with its cosmopolitan demi-mode, if he had included more Latin and Greek in his poems, and if he’d kept his political outlook to something between Tory and crypto-Fascist, that he might have scored more academic cred in the second half of the 20th Century. And his more general popularity, like that of Edna St. Vincent Millay, is in danger of dying out after the death of the fire-starter without the hard-blowing bellows of academia keeping the embers glowing. If that’s so, who does that leave to keep Sandburg’s poetry more broadly heard? If anyone remembers Sandburg, particularly the spare, Imagist Sandburg, it’s musicians and composers. He gets set to music often, and his free verse often sings easily. And, it seems to me that musicians, rather than page-poetry curators, more often remember the innovative modernist in Sandburg. One of my favorite records of 2017 was Matt Wilson’s “Honey and Salt” which, like the Parlando Project, seeks to use a variety of music combined with Sandburg’s underappreciated broader pallet of literary expression in unexpected ways. Today’s piece, a slightly remastered version of one I used to test streaming audio here before the official launch of the Parlando Project, is Sandburg’s tender “Winter Milk” as performed by the LYL Band a couple of years ago. You can hear it with the player below. 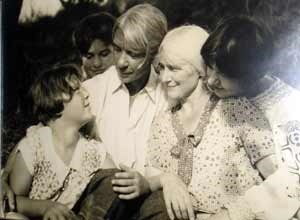 A slightly older Helga Sandburg on the left with her parents and sisters. A gentle reminder, I encourage readers and listeners here to share the links to these pieces on social media as it helps spread the work that Parlando Project does very effectively.